Fashion week in New York kicked off just a few days ago and celebs, socialites, and fashion elitists everywhere hit the streets and the runways to check out some of the fabulous fashions that we can anticipate for the spring and summer of 2011. Now we know things off the runway have a tendency to look ridiculous, futuristic, and over the top, but we've put together a lovely little grouping of some items that we think are absolutely wearable right off the runway. High fashion isn't just for models and celebs -- sure there are some new items that leave you wondering if you would wear it to parachute out of a plane, but there are many that are flirty, feminine, and simple enough for the every day girl next door like yourself. You can check out some other designers over atElle, but here's a look at some of our fashion weeks faves, so far. Quite possibly the most wearable full collection!! Every piece is flowy, delicate, and feminine -- perfectly showing off the female silhouette in a way that is modern, but still tasteful and classic. While not all of the items in the BCBG show could be regular, everyday items, we think these sweet and dainty frocks would be easy to incorporate into your wardrobe! Charlotte Ronson is young and typically rather stylish, but most of the collection reminded us of the 90's grunge kind of style that seems inappropriate on our 20-something frames. Luckily there were some fun little tops and dresses in the mix that redeemed her for us, we'd just suggest loosing the hats. "70's style with a modern twist" is how we could describe the Derek Lam collection. With minimal embellishments and rather simple but time tested silhouettes, many of the pieces in this collection are pretty wearable, some even professional enough for the office. We were certainly Wu-ed by the well thought out, exquisitely tailored, and perfectly pulled together looks in Jason Wu's spring/summer collection. Jason Wu surely hit the nail on the head with this collection that combined structured jackets, girlish dresses, and pants with feminine fabrics, prints, and embellishments. Seriously, who could resist the large bows?! Oh, my! Never have neutrals looks so luxurious! Jill Stuart's collection is clean, crisp, and absolutely romantic. Sure, it lacks the colors of spring, but what it's missing in color it makes up for in beautiful fabrics, ruffles, and amazing two toned shoes!! 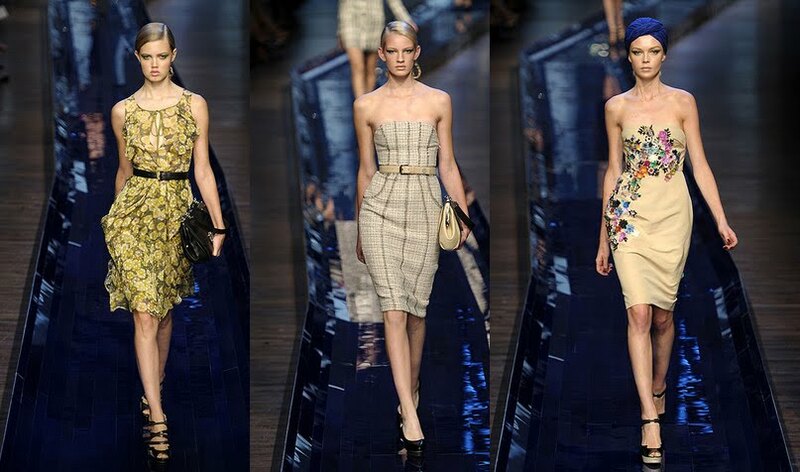 Vibrant, youthful, and pretty - Lela Rose harnesses the energy of spring and summer in her 2011 collection. Models clad in Peruvian inspired colors like orange, pink, yellow, and teal paraded down the runway in styles that we're sure to see around this Spring, including the new line of shoes for Payless! 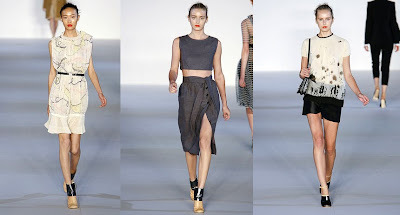 Bright and fun shoes, belts, and electrified prints were all over the Peter Som runway! Breaking away from the whites and grays and light airy colors that we've been seeing, Peter Som's collection is feminine and tailored but definitely not boring! Ports 1961 brought us on a desert safari with the khakis, nudes, and beiges mixed with exotic jewel tones and army greens! Many of the looks were loose, casual, and very down to earth -- perfect for the day in the park or for lounging around by the oasis. Bring on the curves! Victoria Beckham is certainly a real lady and her collection exhibits just that. A tribute to the hourglass figure, these feminine frocks are retro inspired but in modern colors like white, black, and rose gold! And we really admire that she opted to use "real figures" when modeling her collection -- no size 0 allowed! Stay tuned for more on Mercedes-Benz Fashion Week 2010 and get the scoop on fabulous designers like Ashleigh Verrier, Tadashi Shoji, Yoana Baraschi, Maladrino, DKNY, Rebecca Taylor, and more! !